Is there any overall story or concept behind the Tiara album title? Yes there is. It’s not based on anything – like a certain story or certain events – I mean it’s purely fictional. It’s a story about present time or a few more years down the line – like a climactic event happens. It’s kind of like The Day The Earth Stood Still – something happens that will capture everyone’s attention – and it will really be a deciding point for where humanity goes from this point on. Will we endure and persevere or are we basically just heading towards our doom so to speak? There is an obvious story line where something – an entity arrives on Earth – and what happens then – humanity is kind of put on trial – and how do we deal with that and how do we try to plead our case? The intention was always open to interpretations either being like environmental or religious or science fiction. I hope that people can read different things into this. 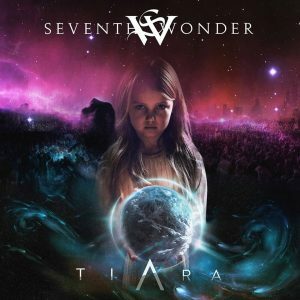 How frustrating was it to wait so long to record Tiara, and do you think we’ll have to wait another eight years for the next Seventh Wonder studio recording? The answer to the second part of your question is “hell no.” (Much laughter) And to answer to the first part is very frustrating. At the same time – you know when you look back at it, we released four albums between 2005 and 2010 – so that was a really intense time period. Then 2011, Tommy joined Kamelot and our first drummer left the band, and then I moved to the States. So there was a natural hiatus for about a year and a half when nothing much could happen. We had to get a new drummer – I had to come back – we needed to figure out what Tommy’s place was going to be and was he still in the band. And then we started writing, and the idea was to get something out by late 2013. We didn’t get a chance to do that because Tommy was out so much with Kamelot releasing two albums within that time period. And then once I realized that, I said “Okay let’s do something else that the fans would want.” We did the whole Mercy Falls Front To Back live thing that people have been asking us about for many years. So we did that, and that was recorded in 2014. Which brings me to our next question. Would Seventh Wonder and Kamelot ever want to do any shows or tours together? I think that would be awesome, but it’s equally impossible because Tommy would never be able to do a double set like that. Unfortunately I think that’s something that we are never ever going to see happen. Maybe we could play a festival where one band is playing the first day and the other band is playing the next day – but never like an opening act and a main act – that’s probably not possible. The thought is very appealing because you’ll get some of the same people who are going to be in the same place anyway – unfortunately it’s something that very fun to think about, but probably not feasible. What could one expect from a live Seventh Wonder show and will there be any shows? We’re definitely going to go out and play. A couple of weeks ago, it was announced that we are going to be heading back to the States again next fall to play Prog Power – so we’re really looking forward to that! And we would like to get some more U.S. shows happening in connection to that, but that’s a big deal and a big undertaking – and I’m not really sure there are resources enough for that to actually happen. At least (the Prog Power) show is going to happen for sure – that’s settled. And we’re definitely going to go out and play Europe some. So we’re definitely going to try to get out and play as much as we can during 2019 – that’s the ambition that we have. You mentioned the live album which you recorded at Prog Power and I wanted to ask about that. What was the experience like playing Prog Power in 2014 knowing you were recording a live album? We had some idea what to expect, seeing that we had been there in 2010 and played. It was however very stressful this time of course, because you knew you had one shot to record two and a half hour of music with no retakes – and in a festival setting where you can’t really do a proper sound check either. The setup – it was an ordeal going through that – but at the same time, we knew the deal going into that, so we practiced a lot. And I’m very proud how well all the guys performed – especially Stefan our new drummer, who had to learn our entire back catalog and carry the band on his shoulders throughout the set. If Seventh Wonder could open for any band either now or from the past, who would it be and why? That’s a cool question. Maybe that would depend on who you ask in the band – everybody in the band loves Queen when Freddie was still around. But on a more realistic note, it would be cool to open for Dream Theater or Symphony X, because those are the bands that all of us in this band still love and have in common – so that would be the most awesome experience that I could think of. And do you have any messages for Seventh Wonder fans who have been waiting a while to hear a new studio album? First of all, we are super proud of this album – and I really, really hope and believe that fans will like it too. I just want to lift my hat and say thank you for anybody whose actually stuck with the band for such a long time without much happening. It’s super humbling, and it makes you super proud, super happy and super thankful. We just hope we get a chance to come out and play, and we hope that everybody will continue to support our music, get the albums, and come out to the shows.